In a society where Art is omnipresent as a collective phenomenon, Art is not something that happened but something that happens. 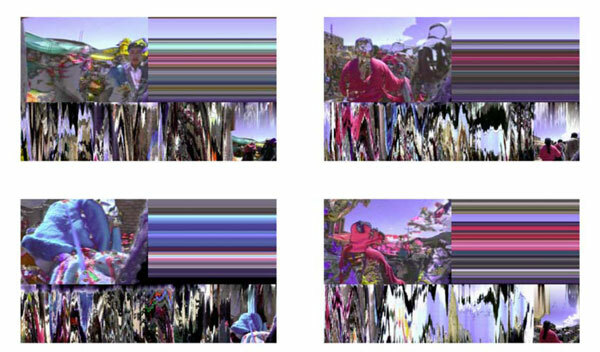 Based on analogue and digital video, this electronic weaving is produced from the analysis of the colours and movements of the video images. The market road in-situ “weaving machine” interweaves horizontal and vertical threads from colorimetric measures of the saturated colours of the Bolivian market tissue. It also allows the viewer to see “through time” using progressive keying through displaced film strips. In this installation, particular attention was devoted to the Andean civilization and to the reversed direction which characterizes the Aymara people's notion of time: the past is visible, in front of us, but shrinking. The future is invisible, and therefore, behind us. Our conception of time as a linear path from the past behind us to the future ahead is not a universal concept. This metaphor, coupled with the idea of weaving as an act both in time and against time, originate the piece.